There’s a way to visit Venice with no stress: buying the Venice city pass. Once you’re on holiday, the last thing you want to do is wasting time purchasing boat tickets, and queueing for all the attractions in the city, mainly because is the only period of the year when you have actually time for yourselves and you want to enjoy it doing the things you love to do. Venezia Unica is the Venice city pass, ideal to all those tourists like you, who want to make their life easier while on vacation. The pass is promoted by the city municipality and you can use it for public transport, cultural events, and attractions. How does Venice City Pass work? The first thing you need to know is that you can buy the Venezia Unica card with a click from home, planning your trip to Venice in advance. In terms of public transport, there are many alternatives to choose from according to your needs. For example, you can choose to buy a ticket valid for 1 day, 2 days or 3 days to travel around Venice and have a tour of its islands, or you can also choose the option which includes the ticket to get to Venice from the airport and back. Depending on how you plan to spend your time in Venice, you’ll be able to create your personal Venice city pass. Once you’ve bought it, you’ll receive an email with a booking code that you need to print out, since you need to present it at every attraction you decide to visit. You’ll also need it to collect vaporetto tickets at one of the Sale and Collection points around the city. There’s no need to have a physical card if you only purchase a pass for churches and attractions. 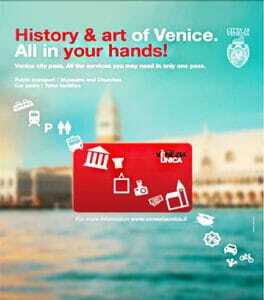 Where to buy Venice City Pass? As we said, you can buy the Venice city Pass online, through its official website, which is the easiest and comfortable way to do it. If you arrive in Venice without the pass, you can purchase it at one of the many points around the city, branded Venezia Unica. Of course, buying it online is the best way to avoid queues. Is the Venice city pass worth it? Quick answer – it depends. We usually recommend purchasing the pass including public transport at least, since Venice is complicated to visit and if you have just a couple of days you might want to make it easy to travel between points of interest. The price of the three packages we mentioned before (Silver, Gold or Platinum), starts from 21,90 euro per person, but be aware that foundations like the Peggy Guggenheim Museum are not included in these options. However, if you buy the pass online you’ll have a discount on the final price (from 15 euro to 9 euros). If it’s your first time in Venice, we recommend creating a Venice City Pass that includes both attractions and transport, but if you’ve already been to Venice and its islands, and you know how to find your way among its streets, probably the cheapest version is enough for you. If during the day you may need to take a vaporetto, let the evening be the time for you to walk around, finding places to watch the sunset in Venice and getting lost in a city where time seems to have stopped.